In 2014 Drayton Entertainment scored a major coup by presenting the first professional regional production of Les Misérables. Now it has scored another coup. 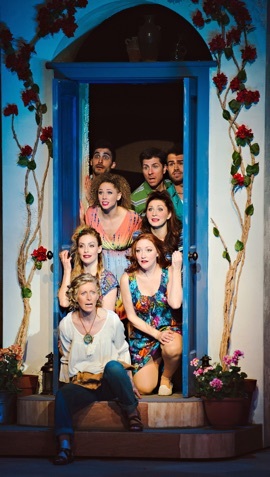 It has launched its 2016 season with the Canadian regional premiere of the global hit Mamma Mia! Last year the musical finished a 14-year run on Broadway, it is still running in London’s West End after 16 years and it was made into a movie in 2008. In this excellent production, director David Connolly focusses on the heart of the story the relation between the free-spirited mother Donna Sheridan and her daughter Sophie. For these roles Drayton has cast two Canadian musical stars. Blythe Wilson, who took over the lead in the North American premiere of the musical in 2000, is Donna in this new production, and Danielle Wade, who won the role of Dorothy in Andrew Lloyd Webber’s new version of The Wizard of Oz in 2013, is Sophie. The musical makes use of 23 songs by the Swedish pop group ABBA (1972-82). When it had its world premiere in London 1999, it was one of the first musicals to take pre-existing songs and use them to tell a story that was not about the group who recreated the songs, i.e. unlike a musical like Buddy – The Buddy Holly Story (1989). Credit for the musical’s success lies almost entirely with Catherine Johnson, who managed to devise a narrative so clever that the songs seem naturally to arise of the situations. People who know nothing of ABBA or their musical would never know that the the songs had been written first and the story after. Another attraction is that the musical has a much more varied palette than do the original songs. In recordings almost all of ABBA’s songs are sung by one or both of the two female singers, Agnetha Fältskog and Anni-Frid Lyngstad. In the musical Johnson has both men and women sing the songs, some as duets or trios, and some by the whole company. To have the songs sung not in isolation but in dramatic situations and to have them sung by a wider range of voices has revealed that ABBA’s songs are richer than one might have assumed from the original recordings alone. For those who somehow do not know the story Johnson created, the action is set in and around a taverna run by single-mother Donna Sheridan, who was once a member of a pop group called Donna and the Dynamos. Donna’s only daughter Sophie has turned twenty and, unlike her mother, wants to get married with a traditional white wedding to her boyfriend Sky (Colin Sheen). Donna has invited the two Dynamos to the wedding – Tanya (Jackie Mustakas) and Rosie (Jenni Burke). Sophie, however, has done something more daring. Since she has always been curious who her father is, she has secretly read her mother’s diary only to find that in the space of a couple weeks Donna had slept with three different men. Wanting her father to be at the wedding she has invited all three possibilities – the American Sam Carmichael (Matt Palmer), the British banker Harry Bright (Michael Killinger) and the Australian adventurer Bill Austin (Mark Harapiak). Sophie’s action enrages Donna, alienates Sky and causes each of the three men to believe that he is the father. Can all this confusion be sorted out in the 24 hours before Sophie’s wedding? In 1999 when the idea of using pre-existing songs to tell a custom-made story was relatively new, original director Phyllida Lloyd knew that audiences would be aware of the artifice of the situation and so emphasized the artifice of the musical. The stagecraft itself was witty and jokey. When a performer sang a song that included a chorus in the refrain, Lloyd would break the pretence of reality and have the chorus suddenly pop up over the walls of the set to sing their part. This constant breaking of the theatrical illusion made whole show seem playful and less than serious. a Dream” felt like just the right, quiet ending to the story rather than merely a pause before the raucous encores. Connolly does pay homage to Lloyd and original choreographer Anthony Van Laast. During “Money, Money, Money” early on in the show, Connolly does have the chorus suddenly burst on stage for the refrains. Van Laast had the great idea on having the male chorus parade across the stage in wetsuits and flippers during “Under Attack” that opens Act 2. Connolly, instead has four guys in wetsuits and flippers do a tap dance routine during “Voulez Vous” that ends Act 1. Otherwise, Connolly creates an air of nostalgia early on when Sophie, seeing all three possible fathers, sings “Thank You for the Music”. During the course of the song the three older men disappear to be replaced by their younger, carefree selves as they would have appeared in 1979. This visually brings home the feeling of the passage of time and change of personality over twenty years more strongly than anything in the show’s original production. Connolly later has three men’s younger selves appear in Act 2 when Harry sings Donna the reflective song “Our Last Summer”. Connolly’s general technique when characters sing of the past is to have the chorus dressed in 1970s style dance along the back of the stage, thus making the sense of the past much more physically present. After the initial homage to Lloyd he does not have the chorus appear to break into solo numbers. Instead they stay behind the scenes. But this, strangely enough, has the effect creating a more generally reflective atmosphere. Connolly choreographs Sophie nightmare sequence during “Under Attack” in an entirely different way. It is no longer humorous but threatening and thus more in accord with the song’s lyrics. Connolly, who previously has been expert at re-creating the dance style of the 1970s and the 1990s, now turns toward ballet with four brides in pointe shoes, like the jilted brides in the classical ballet Giselle (1841) dancing with four grooms while Donna appears to her in an ominous red bridal gown. Elsewhere, in the disco scene for “Gimme, Gimme, Gimme” and “Voulez Vous”, Connolly goes beyond dance to have the male members of the cast show off their acrobatic prowess in tumbling runs across the stage. As one might expect, Blythe Wilson is absolutely luminous as Donna. She is such a fine actor and has such a rich, expressive voice that she able to find more nuance in ABBAs’s songs than did the original singers. The highlight of the show is her extraordinarily moving account of “Slipping Though My Fingers” as Donna prepares Sophie, her little girl now grown up, for her wedding. This she follows immediately with Donna’s angry confrontation with Sam when she sings “The Winner Takes It All”, making the transition from speaking the first lines of the song to singing them with absolute mastery. Danielle Wade rises to the challenge of making Sophie quest to find her father and to learn more about herself more serious. Wade subtly depicts Sophie’s growing desperation when her well-intentioned plan appears to be turning into a disaster. Her pure voice has many chances to shine, most notably in “I Have a Dream”. As for the Dynamos, Jenni Burke’s warm and quirky embodiment of Rosie helps balance the rather icy and generic Tanya of Jackie Mustakas. The three potential father are all well cast. With his lavender shirt and over-precise diction, Michael Killinger rather gives away Harry Bright’s secret right from the start. Mark Harapiak fits right in as the burly Australian and has a fine duet with Wade in “The Name of the Game”. As Sam, Matt Palmer doesn’t exude as much stage presence as the other two, but that is in some ways an advantage. It makes him a dark horse and when he displays his fine singing voice in a biting rendition of “Knowing Me Knowing You”, we realize that there is much more to his character than we originally thought. Colin Sheen does not have to do much as Sky but look good, which he does, but he is a fine singer and his big duet with Wade, “Lay All Your Love on Me”, is one of the highlights of the show. Connolly’s more thoughtful view of the musical ends so satisfyingly with Sophie’s “I Have a Dream”, that the show does not really need its three built-in encores. yet, they are so much fun no one will want to miss them and it gives Connolly a chance to fill the entire stage with his imaginative, energetic choreography. Most people go to Mamma Mia! simply to have a lot of fun, and there is fun in abundance. But you may also find your eyes tearing up more than once because Connolly’s more serious take on the show is so effective. The Drayton version of Mamma Mia! is one that will stay with you long after the curtain falls. 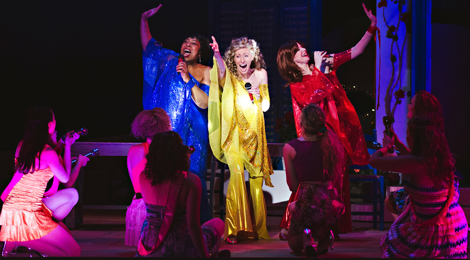 Photos: (from top) Jenni Burke, Blythe Wilson, Jackie Mustakas and ensemble in Mamma Mia! ; Blythe Wilson and ensemble. ©2016 Hilary Gauld Camilleri.